This image is a capture from my video of the Mulvane, KS. tornado. There have been no enhancements made to the image. Left Oklahoma City around 5pm. Targeted developing storms just north of Kansas border. 6:19, I-35 approaching Kansas border. 6:40-7:00, I-35, 5 miles south of Mulvane exit. Watched the developing meso to the northwest. Waited for it to pass over the interstate before going north to the Mulvane exit. 7:09-7:11, Hwy 53, 3 miles west of Mulvane. Watched tornado develop to our southeast while being pummeled by golfball sized hail and strong RFD winds from the north. Saw numerous power flashes and then a rainbow as the sun came out. 7:13, Hwy 53, 2 miles west of Mulvane. Tornado touches down again and doing damage as it tracks toward the town of Mulvane. 7:26-7:36 Hwy 53 at Rose Hill Road, 5 miles east of Mulvane looking west. We got in front of the meso and got to see the Mulvane tornado in it's entirety. Toward the end it kicked up a large red dust cloud. 7:50-8:10, US 77 in Rock. Watched meso wrap back up again west of the town. Decided it was time to move farther east again. 8:20-8:30, County Road 2, 2 miles east of Rock. 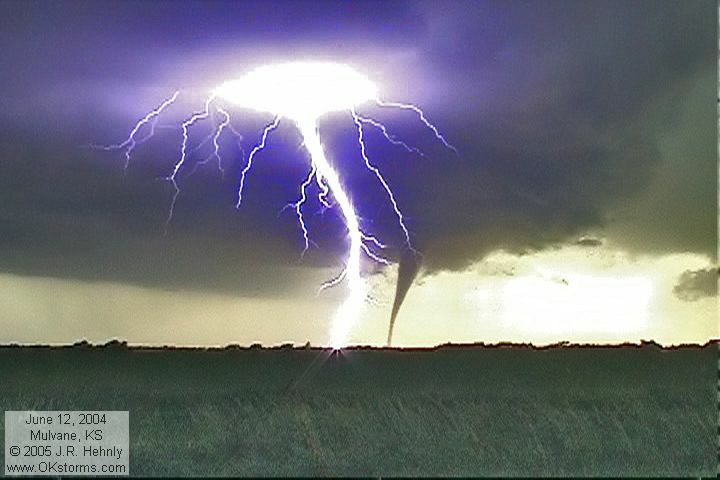 Another tornado forms near the town of Rock. The sun came out just as the tornado was forming. 8:56-9:02, Cowley County Road 2 in Atlanta. Another tornado forms to our south. It's rapidly getting dark making the funnel hard to see, but the debris cloud stands out on the lighter horizon. 9:13, Intersection of Cowley County Roads 2 and 7, looking southwest. Another debris cloud is barely visible on the horizon. Only able to see the funnel in the lightning flashes.